(CNN) -- The Sinclair Broadcast Group ordered its seven ABC stations not to broadcast Friday's "Nightline" because host Ted Koppel intends to read the names of more than 500 U.S. troops killed in the Iraq war, as well as more than 200 others who died noncombat deaths. COOPER: Why have you decided to do this broadcast now? KOPPEL: There's nothing magic about the now. If anything, when my executive producer first raised the issue with me, it was based on a remembrance he had of a Life magazine back in June of 1969, where they did two pages of the faces of young men who had died over the course of a week in Vietnam. It had an enormous impact when it ran back in '69, and he said, "Why don't we do the same thing for Iraq today? And maybe we can do it for all the young men and women who have died." Initially, we talked about doing it on Memorial Day, and then decided precisely because it was Memorial Day, it would get lost in all the background music of a national holiday. You know, between the Indianapolis 500 and the keg parties and the picnics, and it would have more impact if we did it on another day. So here it is. COOPER: Some of your critics have pointed to the fact that this 1969 Life article was sort of the genesis of this idea. They see that -- they look back and see that article as sort of contributing to the antiwar movement. They see that as perhaps an implication that this is an antiwar statement. KOPPEL: Well, it's not. And if people have a little more of a sense of history, they'll realize that the antiwar movement was well under way by 1967. Really got into its full roar in 1968, after the Tet Offensive in February of that year. And was prompted more, I would argue, by the fact that 300, 400, 500 men a week were dying in late '67 and during '68. By the time Life magazine did this in June of '69, believe me, the antiwar movement, you know, was a full, flourishing thing. COOPER: Were you surprised by the response that you've received so far from critics and supporters alike? I mean, did you think you would get this kind of response? KOPPEL: I thought that there would be -- I thought that there would be controversy. I didn't think it would be -- I didn't think it would be this intense. COOPER: What did you think you were going to get? KOPPEL: Oh, I thought we'd have people who would question our motives. They always do. But, I mean, the fact that the Sinclair Broadcasting Group, for example, would charge me with being unpatriotic, would say I was doing this to undermine the war effort, I think is beneath contempt, quite frankly. COOPER: Let me quote you two things that they have said in their statement. 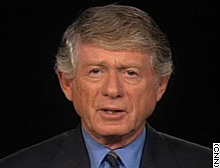 One, "Mr. Koppel and 'Nightline' are hiding behind the so-called tribute in an effort to highlight only one aspect of the war effort, and in doing so to influence public opinion against the military action in Iraq." KOPPEL: Yeah. If this were the only thing that "Nightline" had been doing on Iraq or the only thing that "Nightline" was doing in Iraq, that might have some merit to it. I think of all the programs on network television, "Nightline" probably has done more on Iraq over the last 18 months than any other program out there. To suggest that this program exists in a vacuum by itself is just to ignore reality. COOPER: The other thing that Sinclair brings up, they say, quote, "before you judge our decision, however, we would ask you first question Mr. Koppel as to why he chose to read the names of the 523 troops killed in combat in Iraq rather than the names of the thousands of private citizens killed in terrorist attacks since and including the events of September 11, 2001." I don't quite get the analogy, but I put it to you. KOPPEL: I don't either. And it ignores the fact that we have done any number of programs in tribute to the people who have died on 9/11. And ABC News as a whole has done live coverage of the reading of the names of the people who died on 9/11. I'm not quite sure what he's saying. COOPER: Lisa de Moraes, the TV columnist of "The Washington Post," I was actually most surprised by what she wrote. She basically said, "It is a cheap, content-free stunt designed to tug at our heartstrings and bag a big number on the second night of the May ratings race." COOPER: Is that really true, you didn't realize that? KOPPEL: I didn't realize that. And secondly, I must tell you that the only conversation my executive producer and I had was our perception that most people would probably tune in to this program for a couple of minutes or three or five, and then realize that it's essentially all the same. Only the faces and the names are changing. And that if anything, we were going to lose audience tonight. And we said, you know something, we don't give a damn. Let's do it anyway. But the suggestion that we did this because we thought we could artificially, you know, hype our ratings, it's pretty contemptible. COOPER: Because I got to tell you, if you did think that, there was a Michael Jackson hearing today, and you've got to get some better people advising you on how to boost ratings. KOPPEL: You and I were kidding about it beforehand. We could have done Michael Jackson, Kobe Bryant, Laci Peterson, anyone of them would do more to boost the ratings. But I'm afraid that's not "Nightline," as our viewers know. COOPER: Let me ask you, how much of your decision was -- to do this was based on your own experience as being embedded during the war? KOPPEL: I wouldn't focus it on that. Over the course of the past 41 years, I've covered about 11 wars, or 12 wars, beginning in 1967 in Vietnam. And if there's one thing I've come to feel very strongly is that we have a responsibility in our business to keep reminding people of the cost of war. You may recall when I was embedded, Charlie Gibson and I got engaged in a friendly debate on "Good Morning America" one day on whether or not to show the pictures of wounded and dead. And while I agree that you don't show their faces, you don't, in other words, inform the families on live television that their loved ones have been injured or killed, nevertheless I feel it's very important that we do show the consequences of war. And not to do that is to airbrush it to such a degree that people may get too fond of war. COOPER: What did you personally learn from reading the names, from looking at the pictures, looking at the faces? KOPPEL: It's almost like one of those World War II movies where -- what was the guy who was in "The Life of Riley" -- William Bendix -- would be up there, he would be reading the names of all the guys, and it would be Kovalsky and Schultz and Robertson and Jefferson and Levy. As you see these faces go by tonight, and as you hear the names go by, you are reminded above all other things of the extraordinary diversity of this country. COOPER: And to the family members who have lost loved ones, who will be watching tonight, you say? KOPPEL: I say, we have done everything we possibly can to do this with dignity. We have gone to great lengths to try to get the right pronunciations. I realize nothing could be more off-putting to the families than for me to mispronounce their loved one's name. Inevitably I'm going to do it anyway. Some of them we haven't been able to reach, all 726 people. But we've made every effort that we can. It doesn't matter as much to me what everybody else believes, but I really do hope and pray that the families of those 726 believe that there was no ulterior motive here. We just want to pay tribute to your young men and women.